Charlbury had a workhouse from at least 1771. A parliamentary report of 1777 noted that it could house up to 40 inmates. A further survey in 1803 recorded that there were 29 inmates including some children. The workhouse stood behind some houses at the north side of Brown's Lane and consisted of a group of cottages and a barn. The barn was demolished in 1874 but the cottages survived until around 1950. On 30th October 1773, Jackson's Oxford Journal carried an advertisement for someone to farm the poor of the town, being paid either by the head or for an annual lump sum, and with 'a covenient workhouse and necessary accommodation' available. In 1777, the Chipping Norton could house up up to 40 inmates. According to Meades (1986) the building was located on Church Street. Finstock had a workhouse in the early 1800s on the site of the later National school. Warwickshire: Barton on the Heath, Long Compton. The population falling within the union at the 1831 census had been 15,355 with parishes ranging in size from Little Rollright (population 29) to Chipping Norton itself (2262). The average annual poor-rate expenditure for the period 1832-35 had been £11,001 or 14s.4d. per head of the population. 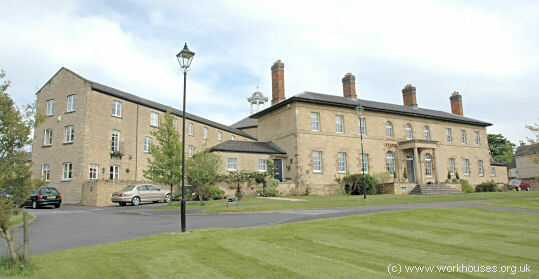 The new workhouse was built in 1836 to a design by George Wilkinson on a site to the north-east of the town between Rock Hill (now London Road) and the Banbury Road. It was designed to accommodate up 350 people for which the Poor Law Commissioners authorized and expenditure of £6,153. 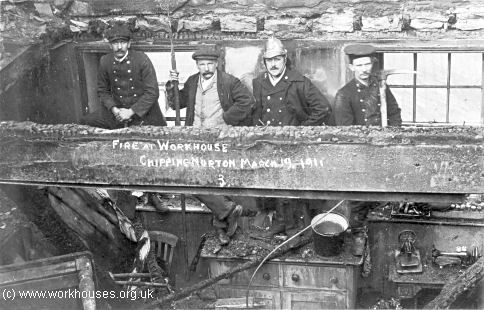 Chipping Norton workhouse site, 1881. Its "St. Andrew's Cross" layout comprised four three-storey ranges to the north-east, south-east, south-west and north-west, with narrower two-storey ranges to the east and west. 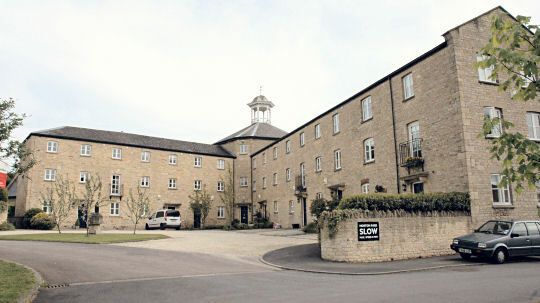 Wilkinson designed several other workhouses in the area including Witney which has similar layout to Chipping Norton. An early view of the building shows it without the porchway which now adorns the front entrance. 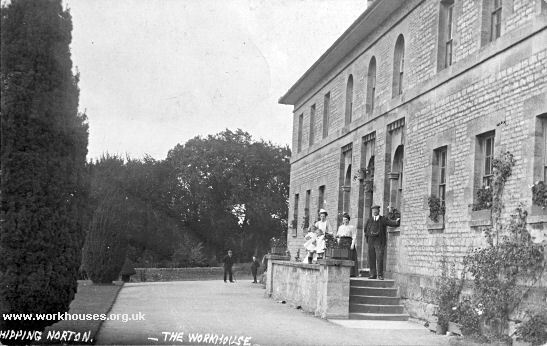 Chipping Norton entrance block from the south-west, c.1910. 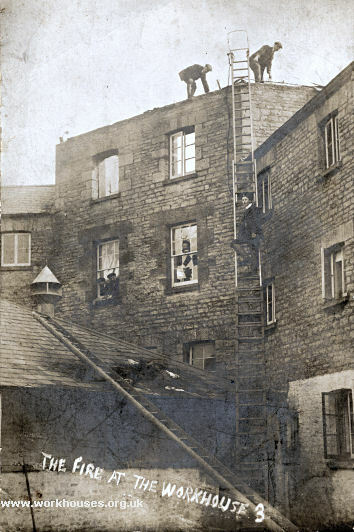 Chipping Norton entrance block from the south-west (detail), c.1910. 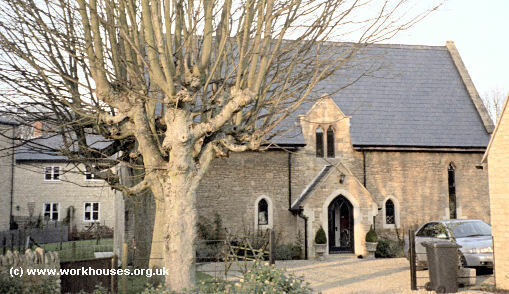 A workhouse chapel, designed by GE Street, was built in 1856-7 at the end of the east range. An infirmary, designed by C Smith & Son, was added in 1904, and a nurses' home in 1936. Through the kindness of T. F. Penyston, Esq., and Mrs. Penyston, the adult inmates of the Chipping-Norton Workhouse, numbering about 40, were conveyed to Cornwell House (the residence of Mr. Penyston), in three brakes, provided by that gentleman. On arriving at Cornwell the party were assembled in a large tent erected in front of the house, where a very substantial hot dinner was served of boiled and roast joints, plum puddings, fruit tarts, &c. After dinner fruit, &c., was handed to the women, and beer and tobacco to the men; the party then strolled about the grounds until tea was announced at five o'clock, when they again assembled in the tent and partook of an excellent tea. Mr. Penyston then kindly distributed to each man a packet of tobacco, and Mrs. Penyston supplied each woman with a parcel of tea and a pound of sugar. About seven o'clock, cheers having previously been given for Mr. and Mrs. Penyston, the party repaired to their vehicles, and were driven home, after spending a most enjoyable holiday. William Johnson, of Newbury, a tramp, was brought up before the Mayor, on Tuesday last, charged with tearing up his clothes whilst an inmate of the casual ward of the Chipping-Norton Workhouse, on the previous day, and was committed for 14 days' hard labour. Tearing up clothes was a favourite ruse of tramps to get themselves a spell in prison where they reckoned the food was better than in the workhouse casual ward, and the work was easier. The Master reported that Nurse Pink bad been violently assaulted by Mrs. Scarrott, an inmate, who had slapped the nurse's face and threatened to put her in the boiling copper. After hearing Nurse Pink's account of what had taken place, the Board decided to prosecute Mrs. Scarrott for the assault. After they bad arrived at this decision the Master said if the Guardians had not taken action in the matter he should have felt obliged to resign his post. The insubordination in the House had become intolerable, and be, the matron, the porter, and nurse had ail been assaulted, and it was time the paupers received lesson and that they were taught that they could not do as they pleased. 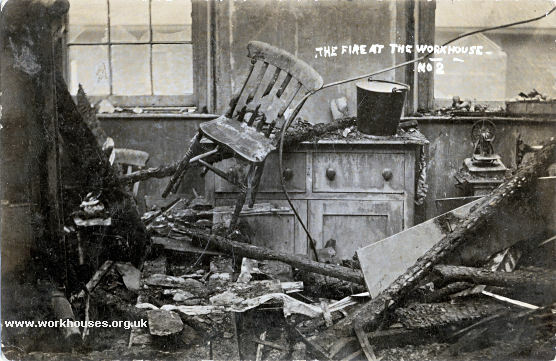 Aftermath of the fire, 1911. Firemen on Monday morning on the Top and in the Stores — they are looking out of the window. This is the remains of the Matron's Stores where I work. This is some of our own brave men on Monday morning after it was all over. It caused excitement and we are all saved and not much lost. Fred has lost all his bacon that he's cured this year. The poor pigs are roasted. It was that that made it worse — he had all his lard out of the pigs up there that made it light up. This is Matron's Stores so you know it they got burnt part of it out and all the new boots they brought out what they could get hold of. 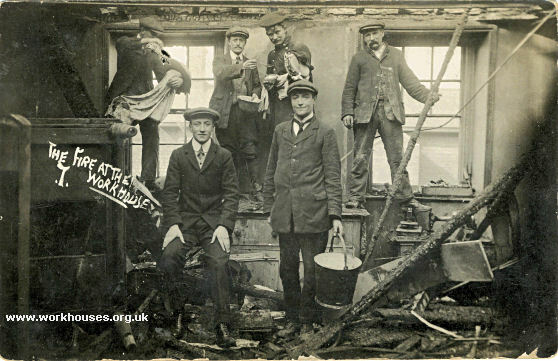 All Fred's bacon stores is burnt down that is what made it the fat and poor old lard stores is burnt right down. It has fell right through to Matron's stores and all down into Fred's kitchen. We are in a state but all saved no-one hurt. This is Matron's stores — I suppose you remember it. Best part of the clothes was saved. I found it out when I went to lock up at 7 o'clock. I went to ask Sarah if she could smell wood burning. I ran all over the House and went up there and lit all the gases up there and opened all doors. In the meantime Fred saw it coming out at the top where the bell was when he came from the Tramp ward and ran down the town hall and rang the fire bell. Beds in Oddfellows Hall, 1911. This is where the women and children slept on Sunday night — it is just the bottom of our own place — they had to all walk down there with blankets around them. I was walking up and down that great room till after 3 o'clock Monday frozen with the cold while Fred was up on the top of the roof where the fire was. Baby was safe at Mrs Hall. She came over crying for Baby — she thought he was hurt. I watched that he was all right. 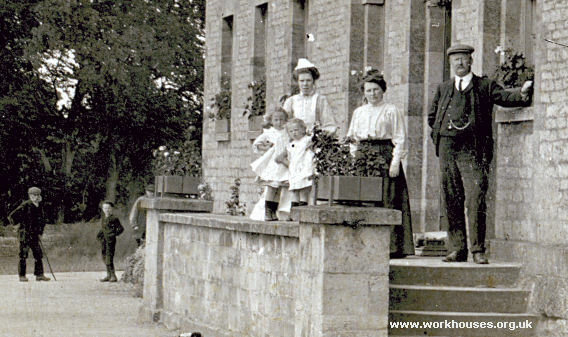 Chipping Norton workhouse site, 1922. 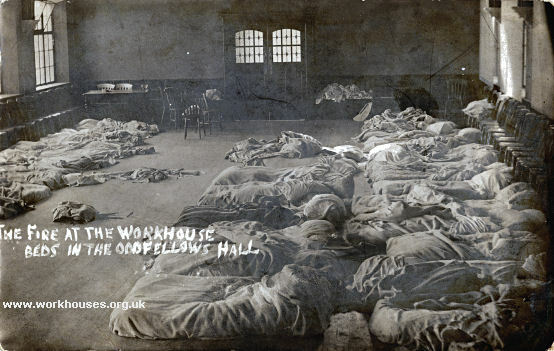 The workhouse later became Cotshill Hospital, then was left derelict for a number of years. In 1996 the front block, central hub, four main ranges and chapel were redeveloped for housing by the Regalian company. At the time of redevelopment, the chapel was on sale for £95,000 as an empty shell, or £235,000 fully refurbished as a 4-bedroom home. Oxfordshire History Centre, St Luke's Church, Temple Road, Cowley, Oxford OX4 2EX. Relatively few pre-1900 records survive. Holdings include Guardians' minutes (1837-1927, with gaps); Admissions and discharges (1906-16, 1919-52); Punishment book (1914-36); etc.